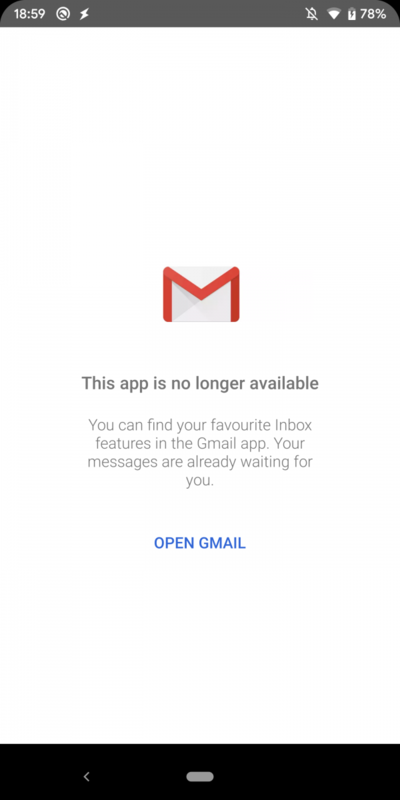 Tomorrow marks the death of Inbox by Gmail, Google’s incredibly popular email client. Since Google announced the discontinuation of Inbox, the company has redesigned the Gmail app, rolled out a smart compose feature, and has announced plans to roll out an email scheduling feature. Two features which haven’t made their way over to the Gmail app include equivalents to the “Save to Inbox” feature, bundles, reminders, and pinned items, although the last three are reportedly in testing. The transition from Inbox to Gmail has been painful for many users, but if you have a rooted Android smartphone it may be possible to continue using Inbox for a little while longer. While digging around into the APK, I learned a little about how the Android app will lock you out of it. It turns out that all it does is compare the current system time with midnight GMT tomorrow. 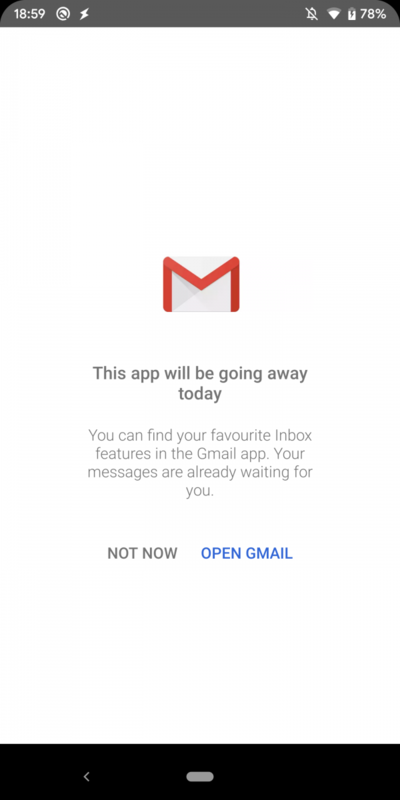 If it’s past midnight tomorrow, then the Inbox app will no longer give you the option to press “not now” and continue using the app. The message that Inbox will display before midnight GMT on April 2nd. The message that Inbox will display after midnight GMT on April 2nd. This is pretty easy to bypass, though. One way you can do it is by changing the date and time in Settings, but I do not recommend doing that because it’ll mess with tons of other apps that rely on the time (like weather apps, calendar apps, and Inbox itself.) Instead, all you have to do is launch the Inbox app with a flag telling it that the countdown timer is still active even when it’s not. This bypasses the check that the app uses to tell if time is up, and so the app will always show you the “not now” option. To test this, I changed the system clock to a much later date, resulting in Inbox telling me that “this app is no longer available” if launched normally, but still allowing me to use the app when I launch it using this trick. I can’t guarantee this will work forever nor can I guarantee that all of Inbox’s best features will work for very long, but this may hold you over until the Gmail app gets the promised Inbox features. You will need the latest version of the Inbox by Gmail app. You will need a rooted Android device because the activity you’re launching is unexported. Modifying the Inbox app is possible, but I don’t think many people will want to install a modded APK of an email client. Then after pressing “not now,” you can open the Inbox app normally to continue using it. You won’t have to re-enter this command if Inbox is still in memory, but if you’re doing a clean launch of the app you’ll have to re-enter it. If you would rather not run this command over and over again, I made a quick app using Tasker that just sends this command for you. You can download it from here. Once installed, just tap on the “Start Inbox” app to run it. It’ll ask you to grant it root access so it can run the command. Thanks to PNF Software for providing us a license to use JEB Decompiler, a professional-grade reverse engineering tool for Android applications.